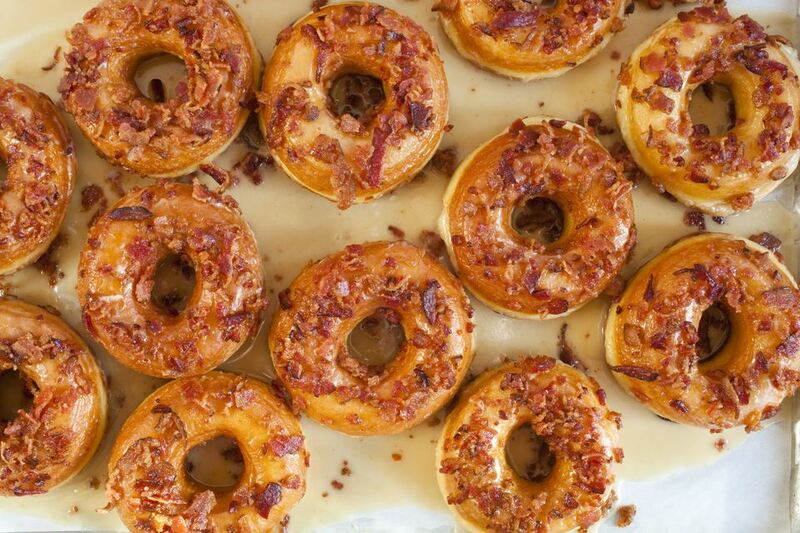 A maple glaze on bacon donuts. Maple glaze can be addicting for some of us. You can make your own maple glaze easily, as it only takes three ingredients. Then you can go wild and find pastries, rolls, cookies, and cakes—almost everything is better when it's maple glazed! It's excellent on cinnamon rolls as well as doughnuts. A glaze is a simple, sugary coating that will harden as it dries. This recipe has only a little fat from the milk. Many icing or frosting recipes have more fat from cream or butter and so they do not harden as much. When working with powdered sugar, it's a good idea to wear an apron. It tends to go airborne when you are measuring, pouring, or mixing it. Place the powdered sugar in a small bowl. Gradually stir in the milk with a fork until the mixture is smooth and shiny and of the thickness you desire. Stir in the maple extract. Keep the glaze covered with plastic wrap until needed to keep it from hardening. To use the glaze, you can drizzle it from a spoon or spread it with an icing knife or pastry brush onto your baked goods. It will gradually harden as the moisture evaporates. Give it a try on ​glazed yeast doughnuts. This recipe calls for maple extract, which you can find in the baking goods aisle of a well-stocked grocery store. Imitation maple flavor extract is produced by mixing natural and chemical ingredients. Natural maple extract is a long process since there isn't much oil in natural maple syrup to extract. As a result, it costs more to buy and it has a shorter shelf life. But there is a secret for making your own natural maple extract, and you don't need a maple tree to do it. Fenugreek seeds will give that maple flavor. You can make your own natural imitation maple extract by toasting a quarter cup of fenugreek seeds in an unoiled skillet, grinding them a little with a mortar and pestle or in a spice grinder, and then immersing them in half a cup of vodka for a month or two. Add a portion of a vanilla bean or a little vanilla extract. You can find fenugreek seeds in a well-stocked spice aisle or an Indian grocery store.